Three film experts. Three questions. One topic. That's the idea behind the Cafe's 3 on 3 discussion panels. 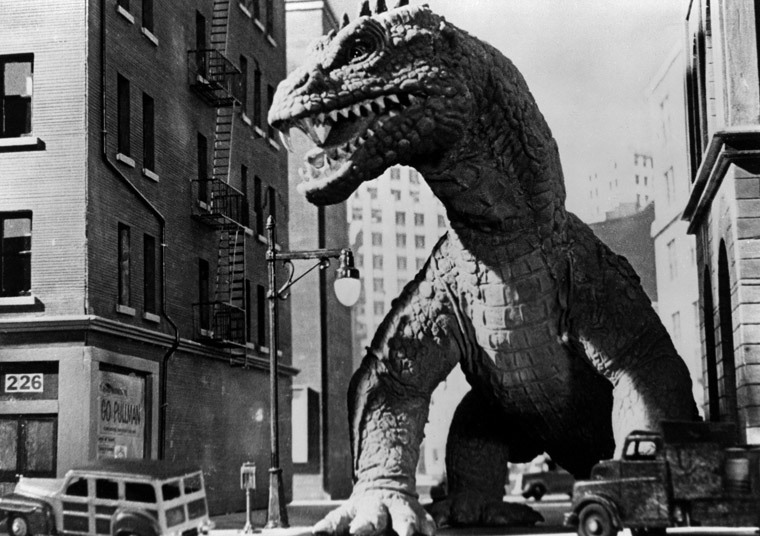 This month's topic is a personal favorite: the classic science fiction films of the 1950s. 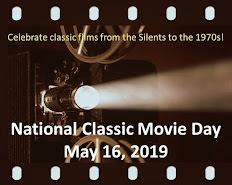 To answer our three questions, we chose a trio of big brains (hey, it goes with the sci fi theme): the classic film blog Grand Old Movies; Tom, who just launched his new blog The Old Movie House; and Chris Cummins from MovieFanFare. Just click on the blog titles to visit any of these marvelous movie sites. 1. In literature, authors sometimes use science fiction to reflect on contemporary issues. Can the same be said of science fiction filmmakers in the 1950s? If so, what kinds of issues influenced their films? Grand Old Movies: Hollywood's 1950s sci-fi films definitely commented on then-current events, beginning with 1951's The Day The Earth Stood Still, which is very much a warning against nuclear-arms proliferation. Many other sci-fi films, of course, reflected Cold-War terrors (e.g., Invasion of the Body Snatchers, It Came From Outer Space). 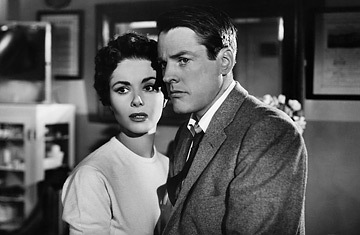 The question may be why such a trend in science-fiction films began in the 1950s (some earlier exceptions, such as H.G. Wells' 1936 Things To Come, also reflect on contemporary history; for Wells, it was an anti-war message in the post-WWI world). It could be because major sci-fi writers with a finger on the pulse, such as Ray Bradbury and Richard Matheson, were either writing for movies or having their works adapted. But I think there was a sense in America not only of its post-WW2 global importance but of having crossed a boundary---post-Hiroshima, we now possessed the capacity literally to destroy the world, and that anxiety permeated many aspects of culture, including films. Plus sci-fi is a genre that, by its speculative, fantastic nature, allows you to express abstractions as concrete metaphors. Forbidden Planet, for instance, gives us the 'Id Monster,' a literal symbol of humankind's unconscious, violent impulses gone out of control. Because the story is on another planet, thousands of years in the future, the filmmakers can embody this concept in a 'physical' form. And I would throw in the competition with that Hollywood hobgoblin, television. One way to drag people out of their living rooms and back into movie theaters is to tell them something about themselves, about what they're experiencing. And sci-fi tries to do that. One fascinating aspect of how 50s sci-fi flicks reflect social attitudes is how they also anticipate issues that would later become prominent---one being feminism. Many of these films have strong female characters, who are often professionals: Women who are not just wives and mothers, and are not working as secretaries, but are frequently scientists and doctors. Faith Domergue in This Island Earth is a major example. Even Zsa Zsa Gabor in Queen of Outer Space is a scientist! She's working in a lab outfitted in an evening gown and high heels; later, she leads the revolution decked in gold lamé and an Uzi. You can't get more progressive than that! Tom: In answer to the first question I would say the underlying theme of movies of the fifties, specifically science fiction films, I’d say was fear. Fear of the unknown. Atomic energy was an unknown. No one truly understood it, not even the people who created the bomb. The scientists thought it might do this, and it might do that. But nobody knew for sure. In the science fiction films of the fifties it was thought atomic energy could and would create horrible mutations. Gigantic animals, insects, and people were everywhere. The engine that powered the spaceship in the film The Day The Earth Stood Still was powered by atomic energy. At the opposite end of the spectrum people shrank as demonstrated in the film The Incredible Shrinking Man and in the film Dr. Cyclops. All because of an energy source many feared, and few understood. Chris: I personally wasn't around back then, but it's clear to me that the era's problems were frequently reflected in popular entertainment of the day. From the subtextual exploration of McCarthyism in Invasion of the Snatchers to how films like Them! commented on atomic age fears, sci-fi was the genre that was consistently commenting on real world issues. 2. In terms of impact on the genre, what's the most influential science fiction film of the 1950s? Grand Old Movies: Most influential is Invasion of the Body Snatchers (1956). It not only is a concentrated example of 1950s anxieties, but its paranoia narrative has shaped so many sci-fi films, even today (e.g., Contagion). Pauline Kael once noted about Invasion that its premise, of people transformed into pods, reflected the fear that "people are turning into vegetables." What Invasion does, as cited in my earlier point, was to take a metaphor and make it concrete---the idea that we are losing our humanity and are becoming unfeeling automatons. What's also striking about Invasion is how viewers argue whether it's a warning against Communism or against McCarthyism. The movie seems able to embrace both sides of the question. Some viewers might think this a weakness, but I think it adds to the film's richness. By, in effect, reflecting multiple anxieties, the film becomes more central, both to 50s sci-fi and to our ongoing concerns about who we are as social beings. Tom: In terms of a specific film having the most impact you have to ask yourself: "How shall I answer this?" For simple economic impact the answer is The Beast from 20,000 Fathoms. It made over five million dollars between the date of is release, June 13, 1953 and Labour Day 1953. From an intellectual point I think the film that had the most far reaching impact is the original 1951 version of The Day The Earth Stood Still. It not only entertained, it actually made people pause, and think. For once the aliens didn’t have to have scales and two heads. Because of that film people started, albeit very slowly, thinking that a unfriendly neighbour might look just like them. The film with the greatest legacy is The Day the Earth Stood Still. It’s regarded by the American Film Institute as one the most important science fiction films ever made. Chris: My pick would be The Day the Earth Stood Still, which remains the most exciting--and ultimately human--cautionary tales of the era. 3. What would you rank as the three best science fiction films of the 1950s and the single most underrated one? Grand Old Movies: My three best are Invasion of the Body Snatchers, War of the Worlds (1953), and The Incredible Shrinking Man (1957). I've outlined my argument about Invasion above, in the 2nd question. 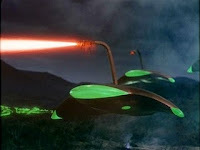 War of the Worlds has been one of my favorites since I was a child---it's exciting, well-done, with great effects; the interest never lags. And it also, if I may dare say it, gives a sense of Higher Meaning---that human beings are linked to a greater power. The film's concluding line, how the smallest things "which God has put on this earth" defeat the Martians, is in the original Wells novel, but it's not central there; Wells pretty much tosses the line away. George Pal, however, concluded his film with the line, and gave it a much different emphasis. The same with Shrinking Man, which ends, quite movingly, I think, with the observation on how the infinite meets the infinitesimal---and that in the eyes of the Infinite, there is no zero. I haven't read Richard Matheson's novel, but I understand he does not conclude with such an observation; it was added by the director Jack Arnold. It does alter the film toward a different reading. 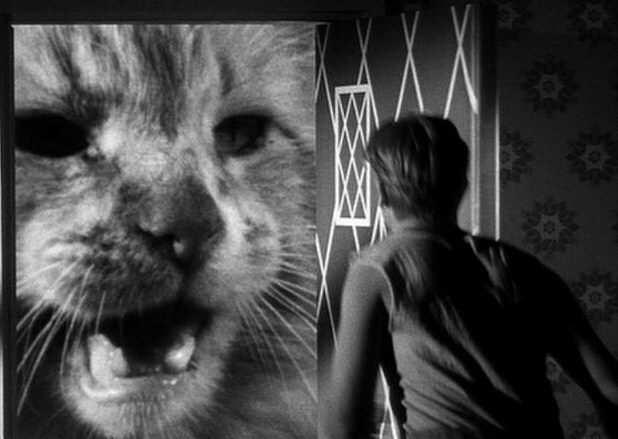 Plus, Shrinking Man is an excellently done movie. It's another metaphor made concrete---the question of how important are our small selves in the vast scheme of the universe. And the last third of the story, in which the hero in his vastly reduced state must confront the terrors of his own basement, is terrific. His battle with the spider appoaches the mythic---ironically, you have to shrink the protagonist in order to arrange a combat with a monster that recalls such myths as Theseus and the Minotaur. It's a brilliant switch. 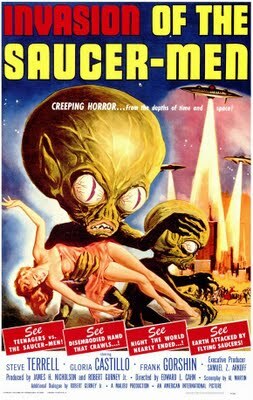 For underrated, my pick is Invaders From Mars (1953). Again, it's another old favorite of mine. I love its child-point-of-view narrative, how everything is told through the little boy's comprehension. That makes events more chilling, as when the parents become inexplicably cold and angry. The set design reflects this beautifully, particularly that all-white police station with its vertiginous, non-ending corridors. And the film's starting-all-over-again ending is unusual. Plus, frankly, what's not to like about that tentacled Head in a bubble! Tom: The three best of the genre appeared at the beginning of the decade. First out of the gate was Destination Moon. Strange as it may seem they got many of the details right. Filmmakers later in the decade didn’t care, as long their pockets books were filled. The Thing from Another World would be my second choice as one the best sci-fi films of the fifties. The Beast from 20,000 Fathoms would round out my choices. For the simple reason it showed what you could do with film, and that I enjoyed it. I think the most underrated film of the fifties was Earth Vs. The Flying Saucers. It was an ok film, but I think it could have been better. Chris: (3) The Thing from Another World; (2) The War of the Worlds; (1) The Day the Earth Stood Still. As for the most underrated, I really have a soft spot for Invasion of the Saucer-Men. It's an incredibly fun romp that is highlighted by some truly great creature design. I love this subject. The 3 writers did a very good job with the questions. I think for Question #1, GOM said in a piece of very good writing and insight: "I think there was a sense in America not only of its post-WW2 global importance but of having crossed a boundary---post-Hiroshima, we now possessed the capacity literally to destroy the world, and that anxiety permeated many aspects of culture, including films." Very well said. I think Question #2 has to go to Tom. He made interesting points with The Day the Earth Stood Still: "From an intellectual point I think the film that had the most far reaching impact is the original 1951 version of The Day The Earth Stood Still. It not only entertained, it actually made people pause, and think. For once the aliens didn’t have to have scales and two heads. Because of that film people started, albeit very slowly, thinking that a unfriendly neighbour might look just like them." I don't exactly agree that this particular alien was an unfriendly neighbor, but Tom made the point in an excellent way. Question #2 is a tie for me between GOM and Tom (hey, I'm a poet! LOL!) I love GOM's picks, and the take on a part of War of the Worlds that always was important to me as well: "it also, if I may dare say it, gives a sense of Higher Meaning---that human beings are linked to a greater power. The film's concluding line, how the smallest things "which God has put on this earth" defeat the Martians". Wonderful aspect of that movie, and I'm glad GOM dared to say it in our current rather anti-spiritual climate. Tom's choices are equally good for this question. I really enjoyed his delightful comment about Destination Moon: "First out of the gate was Destination Moon. Strange as it may seem they got many of the details right." That was one of my first sci-fi favorites, and he's quite right about that aspect of it. I did enjoy Chris's comment about Invasion of the Saucer Men. A definite B-movie sci-fi, but I love it! Another fantastic installment in the 3 on 3 series. The series is a great concept with consistently great questions, guests, and really well thought-out and thought-provoking answers. So far the subjects have been well-chosen to appeal to fans of classic film. I'm wondering if there will be a topic soon that specifically relates to television. As for this installment--wow! It really drives home the fact that the 1950s were THE decade for science fiction films, and the panel's emphasis on the anxieties of that decade as the driving force behind these movies helps explain why. I don't think the science fiction of any other era used the genre to explore deeper issues--whether psychological, social, or ethical--the way the films of this period did. My own favorite sci-fi film of the fifties (or any other decade): "Invasion of the Body Snatchers." Rick, you and 3 On 3 guests GOM, Tom, and Chris did a great job on your science fiction panel discussion! I very much liked their focus on how science fiction of that era reflected everyone's fears about the specter of nuclear war, as well as the understandable paranoia of the time. I was also pleased that your terrific panel didn't forget the fun of 1950s science fiction while they focused on its more serious elements with, for instance, THE BEAST FROM 20,000 FATHOMS. Great work, everyone! As others have commented, this month's panelists did an amazing job in addressing the significance and lasting influence of the sci fi films of the 1950s. I believe THE DAY THE EARTH STOOD STILL is the best sci fi pic of the decade--heck, it's one of the finest films ever made. Its allegories, timeless message, and treatment of the media are just a few of the reasons it stands out for me. However, in terms of influence on the genre, I agree with Grand Old Movies that INVASION OF THE BODY SNATCHERS trumps even DAY. It may not have been the first film to exploit the "aliens looks like us" theme, but its portrait of a small town slowly taken over--one person at a time--can be viewed as a comment on Communism, the loss of identity, and the rebellion against societal norms that would become prevalent in the 1960s. For me, the next most influential film would be Tom's second best: THE THING. One of its prevalent themes--scientists who want to learn vs. military that want to destroy--became a genre staple for many years to come. The panelists did a superb job in describing the fears and anxeties reflected by these great sci films. GOM, I wish I wrote your insightful comment on the end of SHRINKING MAN, describing it as an "observation on how the infinite meets the infinitesimal." SHRINKING MAN is a good movie, but it's the ending that lingered with me throughout the years--it's just a mind-blowing thought. For most underrated, my pick is probably FIVE, a tale of survivors trying to form a microsociety in a post-apocalytic world. I've only seen once, but it's stuck with me. I, too, agree with GOM about INVASION OF THE BODY SNATCHERS' influence for reasons previously stated: an expression of paranoia, and people's fears not of the aliens themselves but their effect on humanity, or even that the aliens are masking the fact that humans are killing themselves. 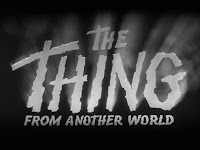 I think that was the essential idea behind the source text for THE THING FROM ANOTHER WORLD and was more directly approached in John Carpenter's 1982 remake. In the '50s, it was Communism that people feared would blanket the country, but it's a fear that still applies. Later sci-fi films such as MAD MAX, BLADE RUNNER and THE TERMINATOR are not about war but the apocalyptic aftermath and even suggest that humanity will destroy itself. I truly enjoy the 3 on 3 posts and Science Fiction films of the 1950s is a fascinating topic to explore! The panel made excellent observations about and selections from the genre. GOM, it is always a treat to read your eloquent essays. Your observations about "Invasion of the Body Snatchers" were spot on and I was delighted to see you include "Invaders from Mars" as an underappreciated gem. Like Tom and Chris, I adore "The Day the Earth Stood Still" and think that it had an enormous influence on the genre. Klaatu's neutralization of electrical power demonstration to the world was thought-provoking and effective. I also appreciated the Christian allegories. Great job, everyone! well stated by all three...this was the Golden Age of Science Fiction...launched by the excellence in writing that started in the 1940s...all these films are masterpieces...the makers of TRANSFORMERS etc. could learn a lot!! I totally agree. How could NONE OF THEM include THEM ! Great cast, tight writing, serious tone.